I was able to convert a few StarDict dictionaries to .dictionary files which are compatible with native dictionary application. These will allow to find you any definition of any word which occurs in those dictionaries. It’s a boon for Sanskrit lovers to have these big/bulky dictionaries in digital/searchable form. Downloadable files are available HERE. Download them. If you get files with .dictionary extension, then fine. If you get any other compressed format (.7z, .zip, .rar), then un-compress them. 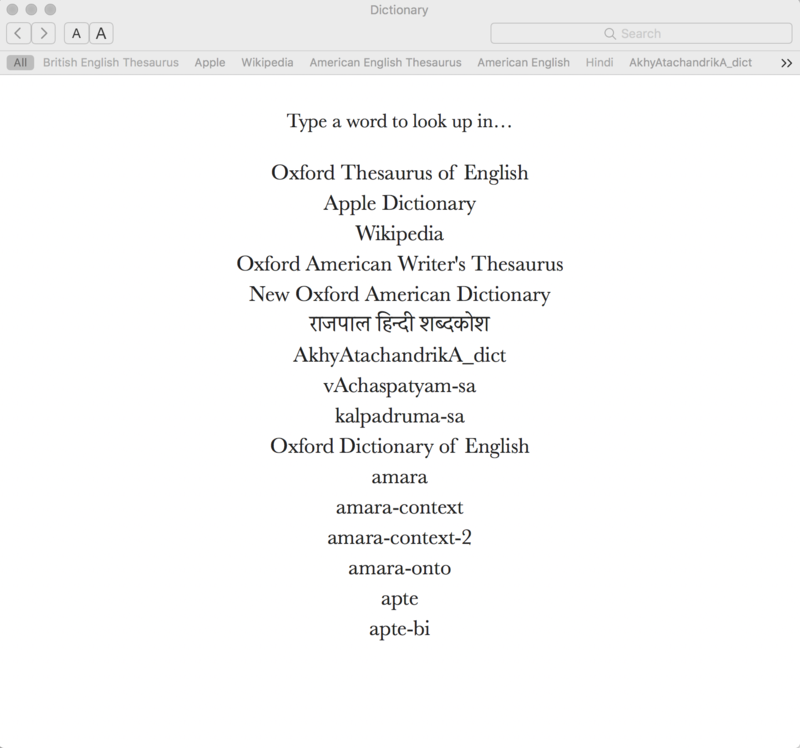 Open Dictionary Application from Launchpad. Copy those .dictionary files there by dragging. The base file which was used is located HERE. Thank to Sanskrit-Coders who are developing many Open-Source programs for Sanskrit. Some StarDict files converted easily, while others were taking ages. So, those which were successfully converted are being put on Mediafire. If some of you succeed to convert those, please share files with us. There are a few benefits of using native application instead of ColorDict/GoldenDict on Mac OS. First, the appearance is very good, clean. Second, it allows you to look up words from many applications. Although we have pop-up option for GoldenDict available, I prefer native application for security reasons too. GoldenDict is not avvailable in AppStore and you need to disable protection to install it. I don’t like this. Please, visit this page and download the software and images from the link. Please, install the software on your PC by double clicking medhA-6.exe(which you downloaded just now). Open MS Word/Notepad or any similar software. Press Ctrl+Shift. It will change your keyboard to Sanskrit one(if your installed it correctly and there is no other IME installed). Now, press each key and test. Watch the printed letter. Now, keep Shift key pressed and press those keys. Note what letters are being typed. Now, press AltGr(the Alt key which is on righ hand side of keyboard) and press other keys. Watch letter printed on screen. Same for Shif+Ctrl key pressed. Now, look at the images you downloaded. Compare them with the printed text. Are they same? If yes, then OK.
Remembering keys is very easy. We have followed similar sounds to maximum extent. So, you will find क and ख on ‘k’ key; although ख needs press of shift key. Similar for च, छ, etc. Some special characters are on IME. They were explained here. The change is in position of those special keys. ‘AltGr+a’ bring ‘zero width zoiner’, while ‘AltGr+b’ brings ‘zero width non-joiner’. Rest is easy to understand from pictures and the practice I prescribed in beginning. Version 6 of medhA keyboard for Unicode Sanskrit is ready. It is similar to old version, medhA-3. So, it also follows phonetics. In that way you don’t need to remember most key. They come to you naturally. Previous guides posted at my website and that of svAmI nIlakaNTha will help you. Alt Gr allows you to type full stop(. ), comma(,), Rupee Sign(₹), exclamation(! ), etc. and some vaidika signs. So, from now you don’t need to switch keyboard to English for comma, full stop, etc.Installation package is available here : medha-6.exe. A detailed change log may be posted later. swAmI nIlakaNThAnanda giri ji was always a part of development of ‘janani’ and ‘medhA’ keyboard-layouts. I always asked him to help me improve these as he was more involved in devanAgarI typing. Now, he suggested to make a self-extracting self-installing archive for medhA to get rid of iso-explorers. This was a good idea. I thought to bring it to reality but delayed. So, he created one. I checked it, improved it and it is now made available to all. You can install “medhA-3” in less steps and you don’t need additional softwares to extract or open .iso image. This version is compatible with Windows XP, Windows Vista, Windows 7, Windows 8, 8.1 and Windows 10. Help for medhA-3 is available in hindi at swAmI nIlakaNTha’s blog. Here I present two pictures explaining scheme used to make medhA – 3 keyboard layout. The first one is for normal-state and the other one is for shift-state(when keyboard is used with shift key pressed). This is medhA – 3 in normal-state. This is medhA – 3 in shift-state. Providing this picture is helpful for those who want to develop their own keyboard-layout and for those who want to use my keyboard-layout efficiently, both. For both groups, I will suggest to go through my previous related posts and this can be done by clicking the “Sanskrit Keybord” menu tab above. Although pictures presented here are not big enough to make everything clear, there is nothing to worry. Why? Because you will be able to see bigger view by clicking them from my “Public Picasa Web Album”. Another thing I will like to make clear is that although this keyboard is bearing name Sanskrit Keybord, it is not only for Sanskrit. 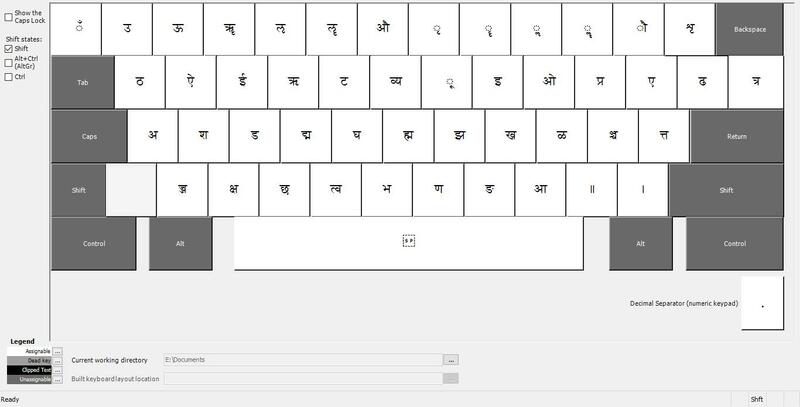 You will be able to write any language which uses Devanagari script. So, it means you can write Hindi, Marathi, Bhojpuri, Nepali, etc. directly with it. So, it is actually Devanagari-keyboard-layout and not Sanskrit-keyboard-layout. WHAT IS THIS ? WHAT IS IT’S USE ? medhA keyboard-layout is a small program which maps Devanagari letters to your conventional keyboard to make you able to write Sanskrit, Hindi, etc. in Devanagari script. A font is a set of printable or displayable text characters in a specific style and size. Here I’ll be talking about Unicode Fonts. So, the other type is Non-Unicode. Simple. languages and scripts from around the world. Non-Unicode Fonts are specific to a particular language or legacy character set. Why Conversion of Text written with Non-Unicode Font to Unicode ? The first answer is choice. And, the cause of choice is their standard. with it’s looks. I’d to choose one of them. I chose Unicode-fonts. So, Why You Used Non-Unicodes Ever ? used “I-TRANS-encoding” for it. (Its a transliteration scheme.) Then the encoded text was converted to devanAgarI script by I-translator. It was a two-step procedure. At that time I-translator was using font “Sanskrit-99” . So, I had too many Sanskrit-texts written with that font. Its necessary to mention here that it was not an Unicode-font as “Sanskrit 2003” or “Mangal” etc. So What You Did ? I searched to get any software able to make my all Non-Unicoded texts Unicoded. with the help of I-translator. But, I couldn’t do that. There was no software to convert Non-Unicoded text to I-trans scheme. The new I-translator was supporting conversion of Unicoded devanAgarI text to I-tran scheme. But my texts were not in Unicode-font. I went for other search. This time I found a Google-Group dealing with this problem. It provided a HTML-page to convert font of text from “Sanskrit99” to “Sanskrit 2003”. I downloaded the page, and tried to convert my texts. And wow….my texts were Unicoded. now, it was working superb. Thanks to THAT GOOGLE GROUP. It has many other tools also. One should have a look. Due to change in policies of Google Groups, all fonts, convertors and other files are stored on Google Sites by Group Moderators.